Want to saddle up, stick the boots and hat on and have yourself a gun slinging cowboy feast? 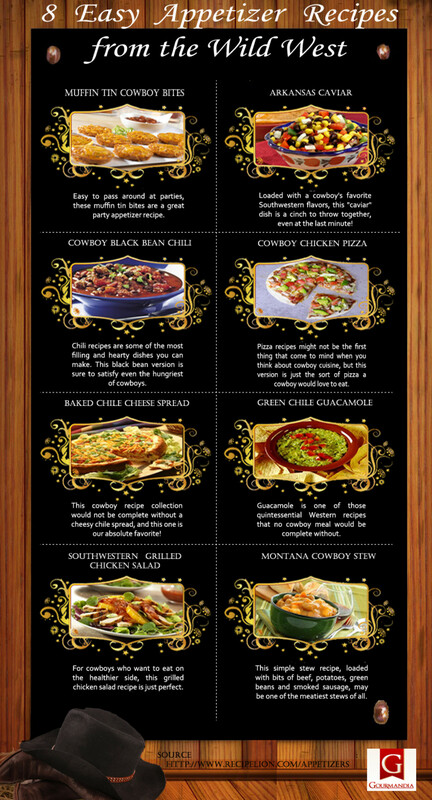 If so and if you want to do it with some interesting dishes then take a look at this infograpic from Gourmandia. It offers up 8 interesting wild west appetizer recipes collected from the recipe database Recipelion. From Muffin Tin Cowboy Bites to Arkanas Caviar a Montana Cowboy Stew made with beef, potatoes and green beans. All of the recipes can be found on Receipilion by searching for the title given on the infographic.